Quiet, Please: Which Aircraft Are the Quietest in the Sky? Recently, I took two flights. The first was an Air France Airbus A380 from New York JFK to Paris CDG. I barely even noticed we had taken off, let alone the relatively subtle roar that is the spooling of the engines at takeoff. Of course — lucky me! — I was firmly ensconced in first class, at the front of the plane. The second flight was aboard a Bombardier Q400 turboprop aircraft from Newark to Halifax, Nova Scotia. On the Q400, I sat behind the propeller. There was a dull roar during taxiing and that roar increased to a visceral, low, rapid thumping as the second engine was started and the plane throttled up. The “Q” of the Q400 is supposed to stand for quiet; a noise-cancelling system is built in. The truth is my ears perceive the Q400 to be about twice as loud as the A380. 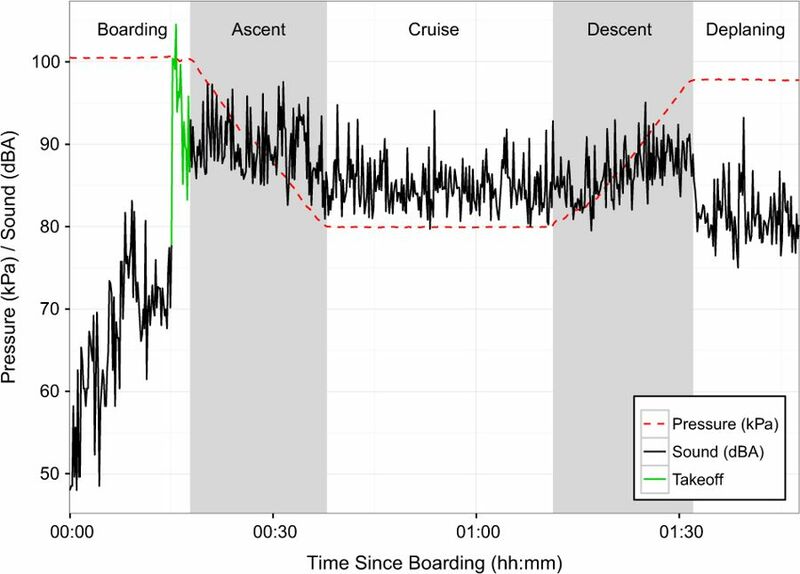 A 2018 study published in the Journal of Exposure Science & Environmental Epidemiology points the way: how loud you perceive the cabin noise to be depends on the aircraft, and where you sit on board. On the Air France flight, had I been sitting on the lower deck in economy, behind the engines, it would not have seemed quite so quiet. So, which aircraft are the quietest aloft? And where should you aim to sit on board? First, What’s Causing the Noise? Passengers intuitively know that the engines are the main source of aircraft noise. However, in-flight noise also results from airflow around surfaces such as wings, flaps and landing gear. Surprisingly, Canadian researchers found that “high speed turbulent flow over an air­craft fuselage is responsible for a substantial component of the interior noise, and is probably the most important source of cabin noise for jet powered passenger aircraft in steady cruise.” It’s the plane itself moving through the air delivering most of the cabin noise, and not simply the engines. The good news is that the noise levels are decreasing, forced by regulation and steady improvements in engine and aircraft design. The FAA has mandated that aircraft designed after January 1, 2018 must be compliant with new, quieter decibel restrictions. Engines with high bypass ratios (the ratio of air bypassing the engine core to that flowing through the core) results in lower exhaust speed and thus less noise. The engines on most jet aircraft you will fly on these days are almost all of the high-bypass variety. In addition, the advent of geared turbofan engines has resulted in quieter engines. Thanks to a gearbox between the fan at the front of the engine and the compressor behind it, the fan can be slowed down — which makes it quieter, since fan blade tips approaching the speed of sound make a special kind of whine. Geared turbofans can be found most commonly on the Airbus A220 and A320neo series, and on the Boeing 737 MAX. Decibels are measured on a logarithmic scale, not a linear scale, similar to the Richter scale for seismic activity. A 7.0 magnitude earthquake differs dramatically in terms of destruction from a 5.5 on the Richter scale. Similarly, every increase of 10 decibels represents a 10X increase in the intensity of the sound — but critically, a 2X factor of the perceived “loudness” (which is a subjective measure). With that in mind, absolute silence is zero decibels. A typical office setting is 60 decibels. The inside of an aircraft during flight? About 80 decibels, or about four times as loud as the typical office. Decibel levels of a typical flight. From the Journal of Exposure Science & Environmental Epidemiology. The chart above gives some insight into the phases of flight, with takeoff, in green, being the loudest. Here, the cabin noise approaches 100+ decibels, before returning to around 85 decibels in flight. But those values, of course, change with airplanes. Earlier this year, a study was released in the Journal of Exposure Science & Environmental Epidemiology, titled “Assessment of Noise in the Airplane Cabin Environment.” The study measured the noise levels over 200 flights in almost two dozen aircraft types, with the results shown below. The decibel levels do not differ dramatically between aircraft: the loudest aircraft, the Boeing 737, is 4.9 decibels louder than the Embraer regional jet. However, because of the logarithmic scale used in reporting decibels, this means the Boeing is about 50% “louder” than the Embraer aircraft. Similarly, the 737 is 0.9 decibels louder than the A320, or about 10% “louder”. Fascinating stuff. Unfortunately, the study did not include several long-haul leaders, such as the Boeing 747, the Boeing 787 Dreamliner, the Airbus A350 or the Airbus A380. It didn’t include either the newest single-aisle jets, the Airbus A220 and A320neo series and the Boeing 737 MAX. All of them mount newer and much quieter engines than the previous generation. The study notes that “[a]ircraft noise has been significantly reduced by evolution of noise-reducing engine technology (e.g., Pratt and Whitney PurePower Geared TurboFan engine reduces noise footprint by 75%) combined and with the introduction of newer aircraft models and airframes with a lower noise profile (e.g., Boeing 787 and Airbus A380).” I turned to other sources to see if decibel levels were recorded or released. The Airbus A380 is considered to have the quietest long-haul cabin in the skies. So much so that pilots have complained of poor sleep because they can hear every baby cry and lavatory flush in their crew rest bunk at the rear of the aircraft. Indeed, Randy Tinseth, Boeing’s VP of Marketing, noted in a 2007 Boeing blog post that the A380’s quiet may not be a benefit for passengers; the drone of the plane cutting through the air would provide a sort of white noise. “You’d probably agree that the most disturbing background noises are the random ones — talking, coughing, lavatory doors closing. How disturbed you are during a flight is a function of the degree to which the random noises rise above the background noise,” he wrote. Granted, he was talking about the competition, but I tend to agree with Tinseth; I’m far more annoyed at the pinging of passengers calling flight attendants than the drone of the engines. Boeing does not appear to have made precise claims about the decibel level in the cabin of the Dreamliner aircraft. However, the 787 features several noise reduction features, not the least of which are the chevrons on the engine which better combine hot and cold air flow to reduce engine noise. One reviewer claimed the Boeing 787 registered 90 decibels on takeoff measured with an iPhone app, which is 10 decibels lower than the aircraft in the Journal study referenced above (or about half as loud). However, an iPhone app measurement isn’t exactly scientifically rigorous compared to a technical study. For that matter, Airbus has its own view of how the Boeing 787 performs compared to the A350. Airbus claims the A350 is “five decibels quieter than competing aircraft [the Boeing 787], and up to nine decibels quieter towards the front of the cabin. This means four times less noise.” This, of course, is without Airbus actually releasing their data. In a word? First class. Various studies cited in the studies indicate that sitting in front the wings and engines is the quietest place in flight, with behind the wing and engines being the loudest. That makes intuitive sense. In addition, the Canadian researchers discovered that window seats were four decibels higher than the middle and aisle seats — or almost 50% louder. All in all, the trend for new aircraft will be quieter cabins. Ultimately, I don’t mind the white noise machine that is today’s modern aircraft. I just wish the flight attendant call button wasn’t quite so loud. Mike Arnot is the founder of Boarding Pass NYC, a New York-based travel brand, and a private pilot.